Projectmates Construction Project Management Software brings you the necessary features to manage your construction workflow. At any time, construction projects can easily require oversight from multiple facets needing real time data. With a construction workflow management software, all guesswork as to where requests should be sent is eliminated, saving time and a lot of effort. Projectmates workflow features provide an intelligent system that automates the entire process, making tasks such as tracking requests and receiving approvals virtually effortless. Do you utilize these processes with your construction project management software? A "Request for Information" is easily created within the Projectmates system and will appear in the responsible party's Ball in Court. Clients can also tailor the RFI workflow within Projectmates, specifically to meet the needs of the organization. This is a process by which design and construction details are reviewed and approved. When a submittal is created in the system, the responsible party is notified through email and push notifications; Projectmates can also send an automatic email reminder. Projectmates offers the ability for project managers, design professionals, and construction site crew to report and track work progress directly from their mobile device and updated in real time. Reports can include digital photos, sketches, or other attachments. The Action list module efficiently serves as a reminder to project participants regarding their tasks and task completion dates, giving project managers an easy way to keep track of completed or outstanding requirements. Track meeting minutes and assign action items to different individuals. Even before a meeting occurs, Projectmates has you covered by offering agenda preparation and the ability to convert meeting minutes with the push of a button. The discussion forum can be used to conduct topic based discussions or project wide discussions. Multiple discussion "threads" can be created and designated specifically for various projects or departments with appropriate access rights configured to determine who should be notified of messages. Every workflow in Projectmates supports photo attachments, including RFIs, punch lists, discussion forums, and field reports. Projectmates also offers the ability to drag and drop pictures directly into the project, saving time and hassle. 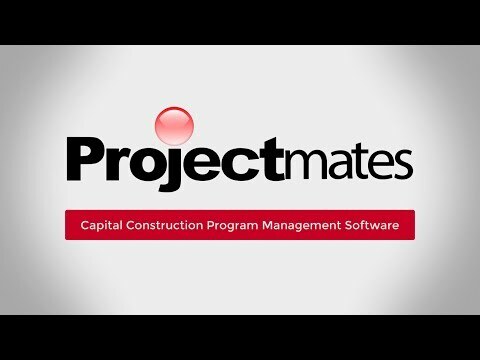 Founded in 1995 by leading architects and software engineers, Systemates, Inc. developed Projectmates to equip owners and owners' representatives in commercial and government sectors with a secure, sophisticated construction project management software solution. Projectmates' collaborative platform dramatically improves project execution, cuts costs and delays, increases accountability, and reduces risks. With its cutting-edge technology, Projectmates creates one seamless platform for managing the complete lifecycle of a building, from planning, bidding, and building to maintaining the facilities. For more information, visit Projectmates Overview. To schedule a personalized demo with Projectmates, click here. In the world of construction project management, efficiency is critical, and we are here to offer a solution. How would you like to streamline your data entry and minimize risk? By using Projectmates software for your construction needs, you can increase efficiency and optimize your budget.